Historically, religion has been a hindrance in economic development as Christianity taught people to work not for themselves, but for God and for heaven, and to obey the laws God had set for them. People were told that being rich was not a positive thing, and through lack of incentive, most men were only as rich as their fathers. If you compare the situation to today, in modern western society, each generation aspires to become more successful and wealthier than the previous one. How did this change occur? When protestantism was introduced to Britain, so was the idea that heaven was no longer obtainable through asking the local priest for help. Protestantism taught people that heaven was only attainable by the few that God decided could come into heaven and the best way for people to show their eligibility was through their worldly possessions. This meant that suddenly, getting rich was good! Gaining money through trade and various other means was now not only beneficial, but also socially acceptable. 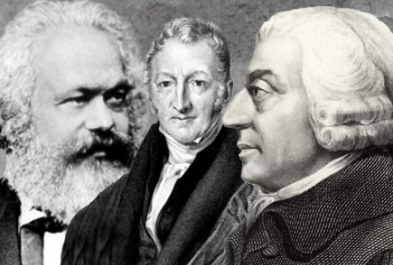 The religious and political dogmas associated with the possession of large amounts of money were no longer relevant and Adam Smith's idea that working for one's own benefit becomes beneficial to society meant that certain forms of selfishness were now seen as altruistic. The development of machinery was critical in allowing trade to occur on a global scale with products being created faster than ever before. This provided Smith with the opportunity to develop his ideas on the division of labour within factories. The famous example he used was of the pin factory, where he estimated an increase in productivity of between 240 and 4800 fold by dividing the labour in the factory. If you are not familiar with the idea of division of labour, the pin factory can be used to explain. Rather than having every worker making a pin each, the division of labour would mean that the task of making the pin would be split into many different parts and each worker would specialise in one part of the making of the pin. For example, the first worker would stretch the wire, the second would cut the wire and once the pin had been made after the numerous stages, the last worker would package the wire. After doing their particular task multiple times, each worker would be a specialist in their task. This allowed industry to become far more efficient and it is one of the most important fundamental ideas in economics. Aside from the above factors, the 'Enlightenment' and the Renaissance before that meant that there were great developments in science. One of the most prominent features that allows development in science is the necessity for people to have their own ideas rather than following superstition and the involvement of logical rules in supporting theories. This allowed people to begin to question what was taught by religion to some extent, and to discover that successful trade and businesses could be developed even without endorsement or support from the Queen (as had previously been the case). What are your opinions on this subject? Do you think that capitalism has made the world a better or worse place? Very informative. Thanks for the insight when we need it most. Thanks, I thought that considering the interesting phase that economics is going through, it would be relevant to consider the history of the subject.